Alignment is when districts review and amend, if necessary the alignment of the clubs, areas, and divisions within their boundaries. This provides us with the structure and the capacity for our district to grow and for District Leaders, – Area Directors, Division Directors and the District Leadership Team – to best serve our Clubs and Members. where there is potential for club growth. splitting a division into 2 or more, as it is more than 6 areas which are at or near capacity of 6 clubs per area. a key benefit is providing a structure for growth – This happened 2 years ago, when Division J, which at the time covered the district from just west of the M25 to South Wales and South West of England was aligned into Divisions A and J. This year’s alignment is “Incremental”. It is proposed that some clubs are aligned within areas and some areas are being aligned within the current Divisional boundaries in accordance with the guidelines above. 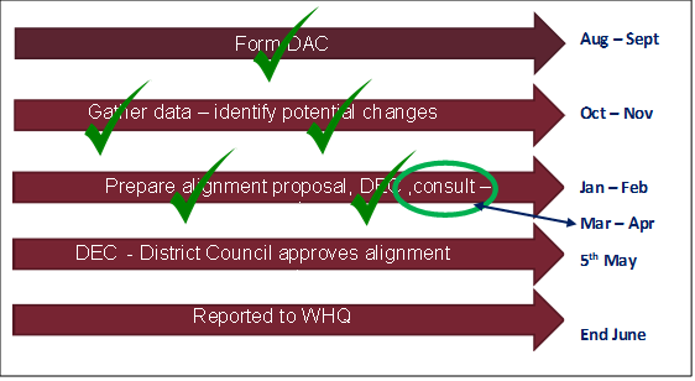 The Proposal was presented to the District Executive Committee and was amended following feedback. 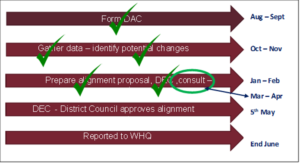 It is now at consultation stage until 12th April and is below, preceded by the timetable for alignment. Click on this link for further information on alignment and the current proposals, and clink this link for even more details, club by club. You can post any comments you may have below or email me. Thats great Paul. But can you explain what PC means? Proposed club? Possible club? Potential club?